Depending on the make and model of your car, the engine may comprise of a different configuration of belts, but whatever the configuration, most of these play a vital role in the performance of your car, and in the case of some, they are critical in the car actually running. Belts use the rotational force of the engine to run other accessories on the car, this can be the alternator, power steering, water pump and the air conditioning unit. If one of these belts fail, the associated component will also stop working. Our mobile mechanics make it a habit to check the belts during any repair to make sure they are replaced before the end up failing. This is used to maintain the correct tension on the belt it is associated with, if this becomes weak it can cause the belt to wear quicker and unevenly if the tensioner becomes tight or is sticking in any position, this can cause premature wear in the water pump and other associated accessories. Although fuel injected systems differ from a vehicle with a carburetor, the basic fuel system is the same. You have the gas tank, fuel filter, fuel pump and then the method in which fuel is sent to the engine. Clean your fuel system starting from your gas tank and adding a recommended premium fuel and system cleaner additive. Clean the fuel injectors or clean the carburetor, the intake valves, the engine combustion chambers using fuel and fuel system cleaner, this can remove any deposits that cause internal parts to stick. Use a fuel and fuel system cleaner that will remove water or moisture from your fuel system. Lubricate the throttle body and throttle moving parts with a corrosion inhibitor and remove old varnish, dirt and any carbon deposits from the throttle casing and throttle plates. Dissolve any deposits from your engine’s intake manifolds, runners and valves, along with the combustion chambers with a multi-stage intake deposit cleaner. Leave engine cleaner resting in your engine that will soften hard carbon deposits over a period of time and help reduce any long-term build-up inside the catalytic converter. This belt rides along a series of pulleys which sit on the front of the engine, these can wear and fray due to excessive heat and the stresses which they endure during repetitive rotations. When these belts are being checked, they should show no signs of cracks, fraying or contamination from leaking fluids. If there are any signs of this, it can cause the serpentine belt to either crack or slip, this would cause excessive heat and the chance for the belt to melt before breaking can be quite common. 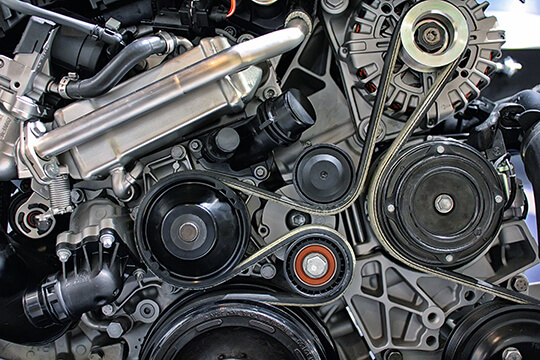 By the design of the engine, it is the serpentine belt which can drive many other functions, so if this breaks there will be more than one function that will not be available in the car, one of which can be the water pump, and if this belt does fail, you could notice a rapid increase in engine temperature as the water is unable to travel round the radiator for cooling. This increase in engine temperature can also bring with it other major problems if it is not noticed straight away. Let our mobile mechanics take a look at your belts and make sure we keep your car on the road (and away from costly repairs).